[theatro] is a rhythmical reading experience, a 5.5 meters long transcript of a seminar performance reflecting it’s original pulse and duration. It is based on the seminar performance “PUZZLE”, that took place at FROWN, Athens initiated by Maria Lalou, consisted of Katerina Drakopoulou [A], Maro Zacharogianni [B], Maria Lalou [O], Mirrored Glass Object [X] and a live-feed camera. 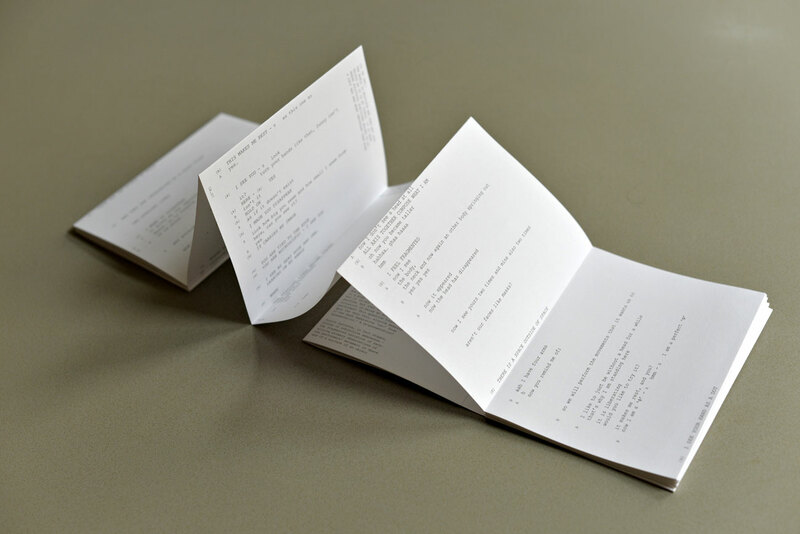 In this work Maria Lalou uses two software platforms for writing. Powerpoint for the pre-fabricated text and a live performed text on ‘Word’, both projected on the screen from her computer. [theatro] is verbatim transcription of the piece with several functions. Next to the documentation of the PUZZLE performance and a manual reading, it also serves as a script for the play, ‘I AM A ‘Φ’. During the book launch in Motto Lalou will introduce the work with the lecture performance ‘theatre of consciousness’ a work based on a critical text that Lalou has written in 2013 for the academic press ‘activate’ published in London prior to the idea of [theatro]. The performance’ theatre of consciousness refers to the seen and the seer through an analysis that places the audience in a central position and as a core thematic of ‘the seen’. [theatro] is published by Onomatopee launched primary in Eindhoven at Lalou’s solo exhibition ‘a spect’ during June 2015. The publication is designed in collaboration with Yin Yin Wong/Werkplats and includes an introduction to the work by Alena Alexandrova. [theatro] leporello will be installed in its full length from the 19th November in the vitrines of Motto accessed through the public space. Lalou is producing a limited edition of prints of the floor plan ‘archetype’ which is one of her basic tools for this series of work, to will be installed in the exhibition space. This entry was posted	on Sunday, November 15th, 2015 at 1:40 am	and is filed under Artist Book, exhibitions, Motto Berlin event, performance, Uncategorized. You can follow any responses to this entry through the RSS 2.0 feed.